How The World Is Reacting To Trump Recognizing Jerusalem As Israel's Capital : The Two-Way Although the move has been welcomed by Israel, many key players in the Middle East have cautioned that it is likely to spark violence and derail peace efforts. 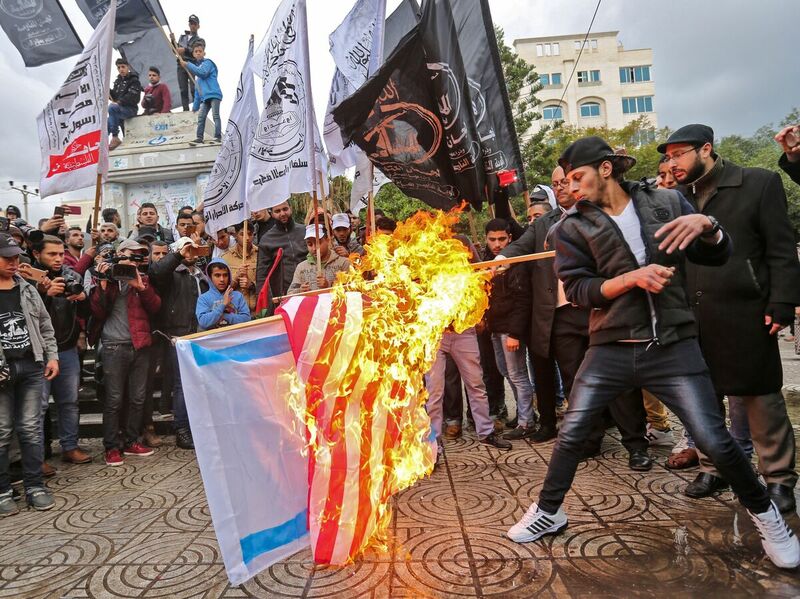 Palestinian protesters burn U.S. and Israeli flags in Gaza City on Wednesday. President Trump has recognized Jerusalem as Israel's capital, upending decades of U.S. policy and ignoring dire warnings from allies. As President Trump announced his decision to recognize Jerusalem as the capital of Israel, other countries wasted little time in condemning the move on Wednesday. Citing fears that it will inflame tensions and undermine the peace process with Palestinians, who also claim the city as their capital, many in the international community also warned the White House against its stated intention of eventually relocating the U.S. Embassy from Tel Aviv to the hotly disputed city. "It incites feelings of anger among all Muslims and threatens world peace," Sheikh Ahmed al-Tayeb, imam of Egypt's al-Azhar mosque, told Reuters. "The gates of hell will be opened in the West before the East." Though Congress passed a law in 1995 ordering the U.S. Embassy to be moved to Jerusalem, successive presidents — including Trump, earlier this year — have issued a series of six-month waivers to forestall the move. Trump is expected to sign another such waiver this week, but he is asking the State Department to begin laying the groundwork for a shift from Tel Aviv. Doing so would fulfill a key campaign promise. No other country has established its embassy in Jerusalem, which is sacred to Jews, Muslims and Christians. Its final status has been a central point of contention in peace talks for decades. Here is how the rest of the world is responding to Trump's decision. After Trump delivered his remarks announcing the move, Prime Minister Benjamin Netanyahu issued a recorded address calling Wednesday a "historic day." "It's rare to be able to speak of new and genuine milestones in the glorious history of this city. Yet today's pronouncement by President Trump is such an occasion," Netanyahu said. "We are profoundly grateful for the president for his courageous and just decision to recognize Jerusalem as the capital of Israel and to prepare for the opening of the U.S. Embassy here." "I also want to make clear: There will be no change whatsoever to the status quo at the holy sites," he added. "Israel will always ensure freedom of worship for Jews, Christians and Muslims alike." Jerusalem's Israeli mayor also lauded the decision in no uncertain terms. "On behalf of the city of Jerusalem, the beating heart and soul of the Jewish people for more than 3,000 years, I thank you from the bottom of my heart for your commitment and intention to officially recognize Jerusalem as the capital of Israel," Nir Barkat said, according to The Jerusalem Post. "This historic step will send a very clear message to the world that the United States stands with the Jewish people and the State of Israel. In Jerusalem, we don't cave to pressure, and we don't let threats or violence stop us from doing what is right." That said, the Post reports several other politicians in Israel are watching the decision with consternation. Zehava Gal-On, leader of the left-wing Meretz party, warned that "moving the embassy could serve Netanyahu but could [bring] about an unnecessary explosion." 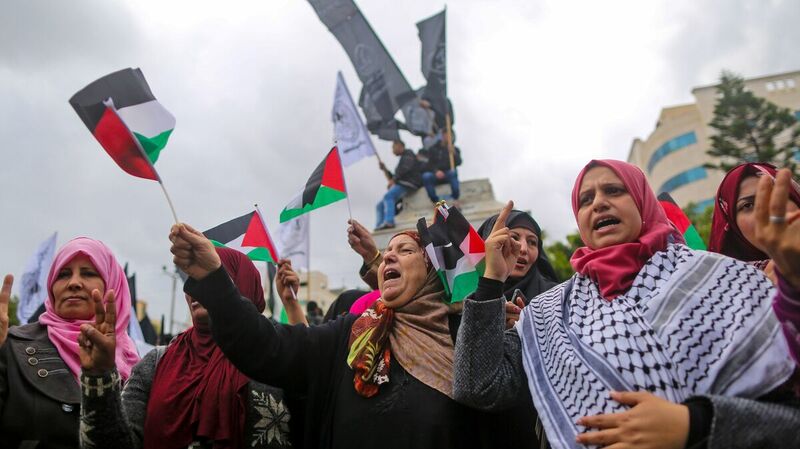 Palestinian women shout in protest during a mass demonstration in Gaza City on Wednesday. Protesters took to the streets in the Gaza Strip on Wednesday, bearing Palestinian flags and shouting slogans denouncing the announcement by the Trump administration. Students also held demonstrations in the West Bank, according to the Palestinian News Agency. "This is an indication of what might come after Trump speaks later today. People here compared the protests to a small ball of fire that would roll and turn into a much larger ball later on," Al-Jazeera reported from Gaza. "The move by the U.S. seems to have further unified the Palestinians. Hamas and the smaller factions in Gaza have given their full support to [Palestinian Authority President] Mahmoud Abbas' Fatah movement in their opposition to the U.S. move. There is full unity on the Palestinian streets behind this cause." Abbas, who spoke by telephone with Trump on Tuesday, warned of "the dangerous consequences such a decision would have to the peace process and to the peace, security and stability of the region and of the world," Abbas spokesman Nabil Abu Rudeina said in a statement. Ismail Haniyeh, leader of the Palestinian Islamist militant group Hamas, a frequent rival of Abbas' Fatah movement, told Al-Jazeera, "This decision is a calculated gamble that will know no limit to the Palestinian, Arab and Muslim reaction. "We call on stopping this decision fully because this will usher in the beginning of a time of terrible transformations," he added, "not just on the Palestinian level but on the region as a whole. This decision means the official announcement of the end of the peace process." 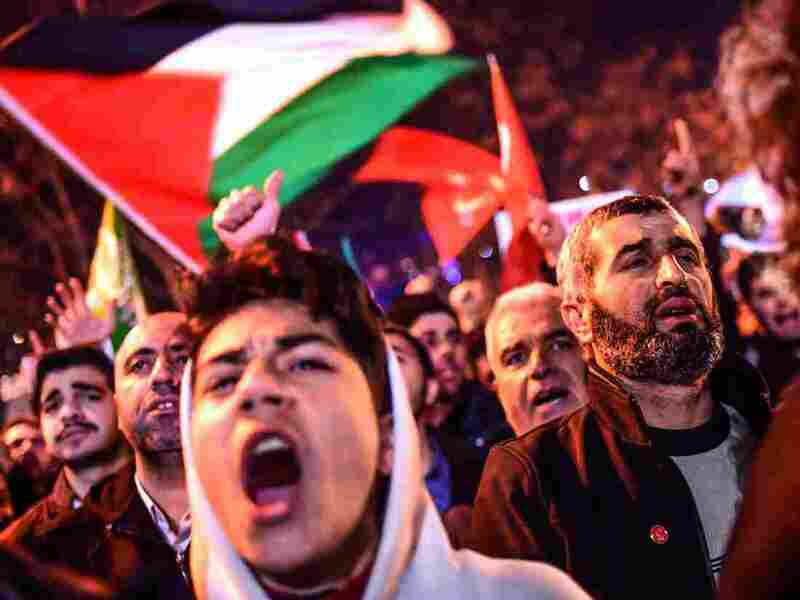 Other Palestinians echoed the angry replies of their political leaders. "This is a conspiracy that is denying us our rights, the first of which is to return. They think we are a branch of thorns that they can step on and break," said one social worker at a Palestinian refugee camp in Lebanon. "But we are a bomb," she told Reuters. "If they step on it, it explodes." At the U.S. Consulate in Istanbul on Wednesday, hundreds gathered to denounce to denounce President Trump's decision. "We paraded Trump as an ally of the Arabs," an Egyptian lawyer told Reuters, "but he turned out dirtier than his predecessors." In Egypt — one of only two predominantly Arab countries, along with Jordan, to diplomatically recognize Israel — President Abdel-Fattah el-Sissi cautioned that the Trump administration decision "would undermine the chances of peace in the Middle East." Jordan issued a statement through a government spokesman Wednesday that rejected Trump's decision outright as "legally invalid." The spokesman cited a 1980 United Nations Security Council resolution, which declared that any Israeli actions that "have altered or purport to alter the character and status" of Jerusalem constitute "a serious obstruction to achieving a comprehensive, just and lasting peace in the Middle East." "Jordan stresses the need for the United States to play its role as a neutral intermediary to resolve the conflict and achieve peace on the basis of the two-state solution, which the world has agreed is the only way to resolve the conflict and achieve lasting peace," the Jordanian spokesman said. He added that Jordan would be calling an emergency meeting of the Arab League in Cairo on Saturday. Turkish President Recep Tayyip Erdogan used even stronger language in a televised speech Monday, anticipating the move. He called it a "red line" for Muslims — and called out Trump by name. If the U.S. proceeds with its plan to recognize Jerusalem as Israel's capital, Erdogan said, "we could go as far as cutting diplomatic ties with Israel." Reuters reports that the headline in a newspaper Lebanon, another Israeli neighbor, also called out Trump by name in a simple, straightforward statement: "No offense Mr. President, Jerusalem is the capital of Palestine." Since Trump entered office, Saudi Arabia has become an increasingly close ally of the U.S. in the region — but that did not prevent the kingdom from expressing its own objections to the move this week. "Any announcement prior to a final settlement would have a detrimental impact on the peace process and would heighten tensions in the region," the Saudi ambassador to the U.S., Prince Khalid bin Salman, said in a statement to CNN. In a statement delivered after Trump's announcement, U.N. Secretary-General Antonio Guterres reasserted the importance of avoiding unilateral action in the area. "In this moment of great anxiety, I want to make it clear: There is no alternative to the two-state solution. There is no Plan B," he said in prepared remarks. "It is only by realizing the vision of two states living side-by-side in peace, security and mutual recognition, with Jerusalem as the capital of Israel and Palestine, and all final status issues resolved permanently through negotiations, that the legitimate aspirations of both peoples will be achieved." Federica Mogherini, vice president of the European Commission, also said the EU "expresses serious concern" — and echoed Jordan in citing Security Council Resolution 478. "The EU position remains unchanged," she said in a statement. "The aspirations of both parties must be fulfilled, and a way must be found through negotiations to resolve the status of Jerusalem as the future capital of both states." For many countries in the West — including the U.K., Canada and Mexico — the response was the same: an assertion that they will not be moving their embassies to Jerusalem and updates to their travel advisories to citizens in the region. Within the U.S., meanwhile, reactions from Jewish groups varied. American Israel Public Affairs Committee, a pro-Israel lobbying group, welcomed the announcement and called Wednesday "a historic day," and several other groups also celebrated the move. At the same time, Reform Jewish Movement said the embassy should eventually move to Jerusalem, but it criticized the timing of this announcement: "We cannot support his decision to begin preparing that move now, absent a comprehensive plan for a peace process," Rabbi Rick Jacobs said in a statement on behalf of multiple organizations. He warned the decision is "all but certain to exacerbate the conflict. Progressive advocacy group J Street similarly denounced the timing of the move as "premature and divisive." NPR's Camila Domonoske contributed to this report.